This versatile 4K laptop is a Black Friday deal you won't want to miss. Are you in the market for a new laptop but you're not sure what to get? Here's an excellent pointer for you. We're keeping track of all the latest Black Friday and Cyber Monday laptop deals as they come in, and this offer from HP looks like a must-have for creatives. The HP ENVY x360 is the perfect blend of power and versatility, a convertible laptop that's ready for any situation, and it's available now with £250 off its usual price of £1,249.00. Running Windows 10 Home 64, it's powered by a quad-core Intel i7 processor running at 1.8GHz base frequency and up to 4.6 GHz with Intel Turbo Boost technology, with 8GB memory plus 16GB Intel Optane Memory, as well as a terabyte of hard disk to give you all the storage you need. If you need a really clear view of your work then you're going to love its 15.6-inch screen; no 1080P HD here, this is a full-on 4K Ultra-HD IPS display running at 3840 x 2160, giving you maximum detail, and to keep things running smoothly the ENVY x360 has an NVIDIA GeForce MX450 with 4GB of fast GDDR5 memory taking care of graphics for you. You want more? 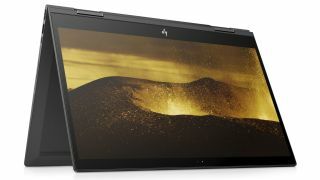 The HP ENVY x360 also features Bang & Olufsen audio for crystal-clear sound, a webcam for those inevitable video conferences, plus a backlit keyboard, HP Fast Charge and fingerprint reader. This flash deal is available right now but there's limited stock available, so if this sounds like the right laptop for you then don't delay. To take advantage of this offer you'll need to use this e-voucher code: BLACK2. Looking for more sweet deals? Check HP's website for more deals on its stock, and keep an eye on our main Black Friday and Cyber Monday deals post so you don't miss out on any amazing offers!